Actor/director known for Soap Box Derby-themed "25 Hill" and as Roger Dorn from "Major League"
(AKRON, OHIO) Dec. 3, 2018 - The Akron RubberDucks announced today the International Soap Box Derby® will be the charity benefactor from the 2019 RubberDucks Hot Stove Banquet on Feb. 1 at the Hilton Garden Inn in Akron. 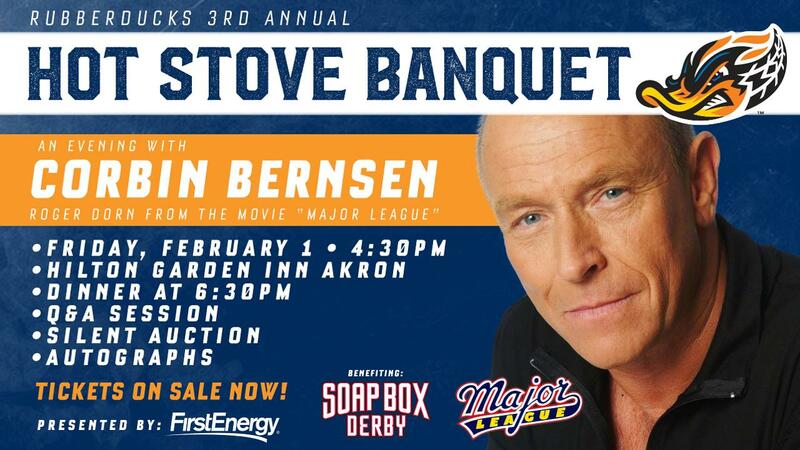 The Hot Stove Banquet will be headlined by Emmy-nominated actor Corbin Bernsen, who played Roger Dorn in the classic hit movie "Major League" and directed the Soap Box Derby-themed "25 Hill." The third annual Hot Stove Banquet is presented by FirstEnergy. It will be a celebration of baseball to help get fans prepared for another exciting season from the RubberDucks and Cleveland Indians. Fans will have an opportunity to ask Bernsen about his acting career, which includes his famous role as Dorn in "Major League" and his time as Arnie Becker on the hit '80s series L.A. Law. In 2011, he wrote, directed, and produced the Soap Box Derby-related film "25 Hill," which helped provide extra funds to the long-standing Akron institution. "We are pleased to be partnering with the RubberDucks for their kickoff Hot Stove Banquet," said Mark Gerberich, president and chief executive officer of the Soap Box Derby. "Corbin Bernsen's tie to '25 Hill' and 'Major League' are both classics, and we are grateful and proud to be this year's recipient. This will help further our leadership, STEM education and racing programs in the Akron Community," said Gerberich. Bernsen previously appeared as a guest at Canal Park in July 2013, when he met fans and signed autographs while the team gave away Roger Dorn snow globes. "It's an honor to partner with an Akron institution such as the Soap Box Derby and help this great organization raise money for its mission of helping kids in the community," said RubberDucks General Manager Jim Pfander. "It will be an extra special Hot Stove because of Corbin's connection to the Derby and his because of his beloved role as Roger Dorn from 'Major League,' which is a cult favorite of Indians fans around the country." The International Soap Box Derby® is a non-profit youth education and leadership development organization whose mission is to build knowledge and character, and to create meaningful experiences through fair and honest racing competitions, STEM curriculums, and other community-focused activities. The Derby's Core Values and Drivers include: Youth Education and Leadership Development; Family Engagement and Enrichment; Honesty, Integrity and Perseverance; Innovation and Entrepreneurship; Teamwork and Collaboration; Mentoring; Volunteerism; and Commitment to Community. The Derby's two youth initiatives are the FirstEnergy All-American Soap Box Derby racing program and the STEM-based Education Program, which provides educational opportunities for K-12 youth worldwide through Soap Box Derby racing. The Derby dates to 1934, when the first All-American race was held in Dayton, Ohio. For more information, visit www.soapboxderby.org.